John models his Foustanella at UOP. 1970s. 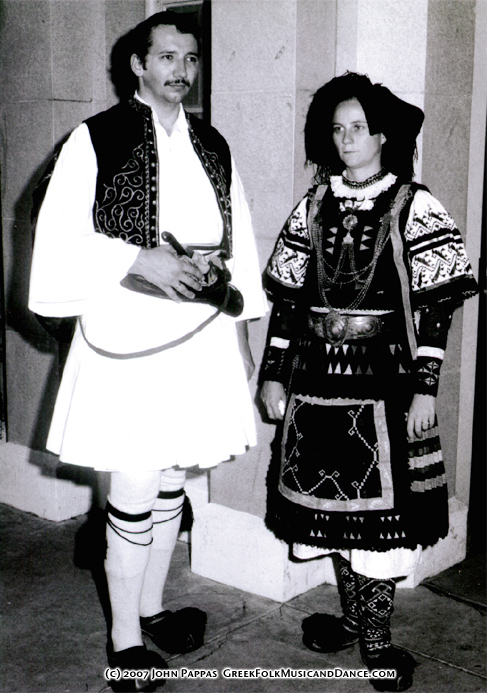 The costumes of Greece are a beautiful part of a very rich cultural history. 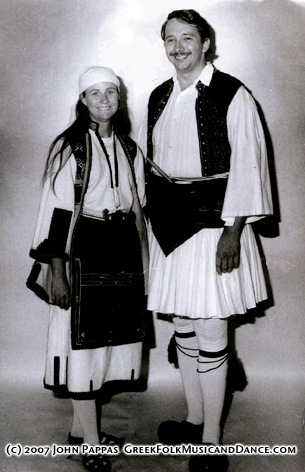 This is just a brief overview of the subject and will include only a few representative examples of some of the costumes that were worn traditionally by the Greek people. 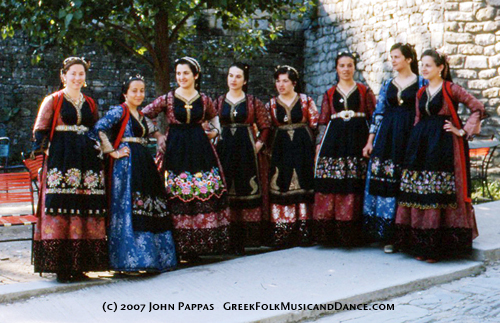 Some of the characteristics of Greek folk costumes can be traced back to elements in ancient Hellenic and Byzantine costumes. In fact, many of the elements of the liturgical clothing worn today by the Greek Orthodox priests are related to the modern Greek folk costumes and have their origin in the clothing of the Byzantine Empire. There are some generalizations that can be made about the costumes and their styles and components. For example, the costumes of the mainland and of the islands are different. Furthermore, the costumes of each area tend to have several elements in common. 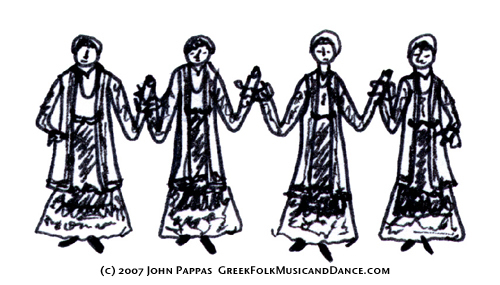 As with the music and other folkloric traditions of the Greeks, although all of the elements of this part of Greek culture are similar, the smaller, individual regions share certain different individual aspects and features. 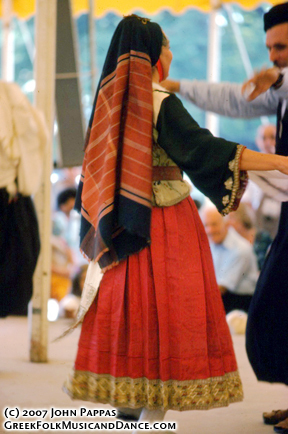 All Greek costumes share similar materials, construction, parts, and designs, but the costumes in the local regions share other individual characteristics which are often very different from those of the costumes of other regions. 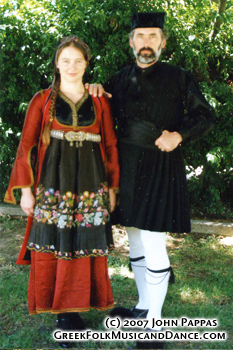 For example, we can identify costumes as being from Epiros, or Mesogeia, or Makedonia; however, we can further narrow the identification of costumes to smaller areas within these broader geographical and cultural areas. We can even identify a costume's village based on individual features such as the shape of a costume part, or the colors or the embroidery designs used. 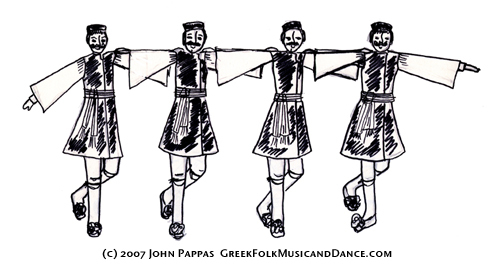 This is also true with respect to the various costumes worn by the Greeks of the islands and in fact of all regions of Greece. Female Kandyla, female Pogoni. Ink drawings by Paula Pappas. Paula in Kandyla Costume, 1970. Kandyla; Arkadia, Peloponnisos. 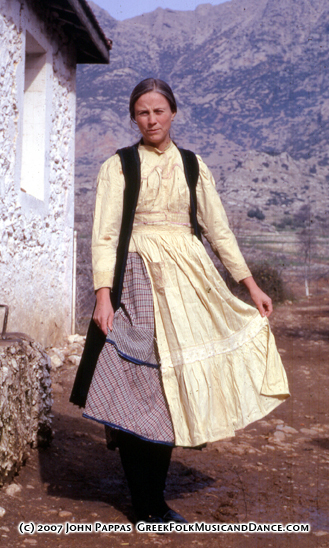 Paula in Pogoni costume, from Epiros. Bridgton, Maine. 1971. 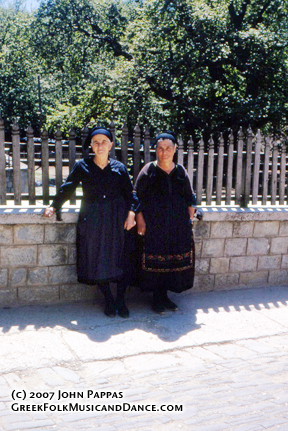 Women from Metsovon, Epiros. Ink drawings by Paula Pappas. Young women in dress Metsovon costumes. Epiros. 1981. Dress Metsovon ensemble, back. Epiros. Older ladies in "everyday" Metsovon costume. Epiros. 1970s. 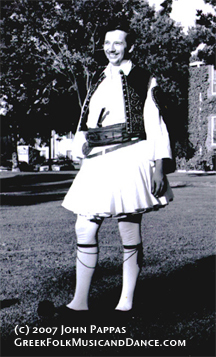 Paula in Sarakatsana costume, from Thrace. Bridgton, Maine. 1971. Paula modelling a wedding costume, c. 1925, from Zevgolateio; Korinthia, Peloponnisos. 1971. Some generalizations about the Men's costumes also hold true. There are two main types of costumes found on the mainland. The most popular (especially since the War for Independence of 1821) has been the Foustanella and its variations. Variations of this costume for men with the distinctive skirt or kilt exist in all regions of the mainland. Sometimes the kilt is connected to an upper part to help hold it up, while in other areas the skirts are worn as a separate part around the waist. There are also variations in color, style, and decoration. Another type of Men's costumes features some sort of baggy or full cut trousers in place of the skirt or kilt. 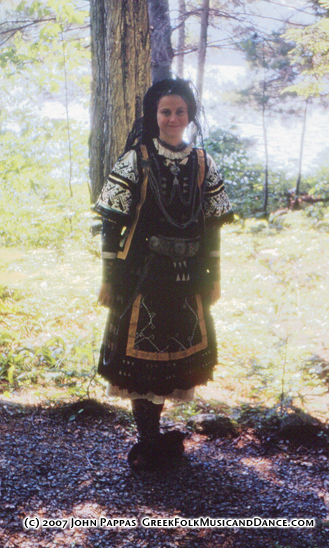 Sometimes these are present as a variant type of costume in place of the foustanella in a given region or village. An example of this is the men's trouser variation that coexists with the skirt type costume in Metsovon. 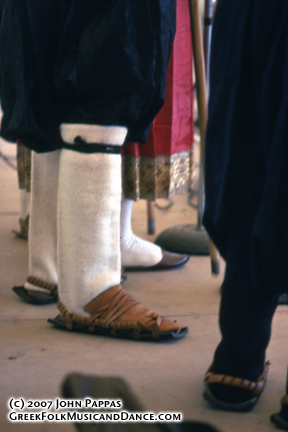 On the islands, however, the very full cut Vraha which reaches to just below the knees takes the place of the skirts or kilts of the mainland Greek. Men in Foustanelles. Ink drawings by Paula Pappas. 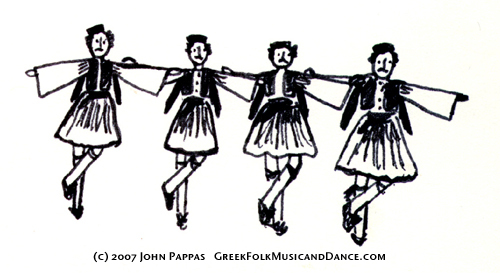 One observation about some of the elements of the costumes, especially those of the mainland, is that in the same way that all the Greek women's costumes seem to be very similar when analyzed closely, sometimes there is also a close connection between the elements of the women's costume parts and the men's costume parts. For example, the cut and construction of some of the women's chemises are often very similar to those of the shorter men's shirt. Similarly, the cut and construction of other elements of women's and men's costumes are often analogous. Men from Epiros. Ink drawings by Paula Pappas. Man in Metsovon Foustanella. Epiros. 1970s. Finally, we can make some generalizations about costumes and what they may symbolize or represent concerning the status or position of the people who wear them. The costumes can indicate the occupation of the wearers. For example, on the island of Skyros, the men shepherds wear a costume that is different in color and style from the costume of the men who are farmers. In fact, in many regions, there are two or three versions of a costume. This is particularly true for women. There is the every day costume which is made from home spun, simpler materials. Then, there is the festival or fancy costume which is worn on special days or holidays. This version is made from more expensive, finer fabrics and often has more components. At the finest level, there is sometimes a version which is worn by a bride. This is the fanciest, richest version of the village's costume and represents the special status of the wearer. 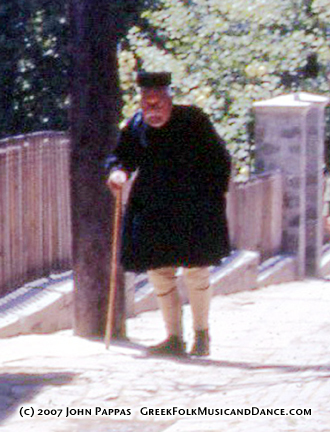 Theofanis Ziazias in Kandyla Poukamisa, 1971. 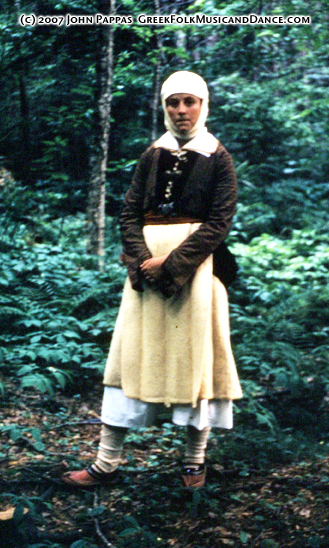 In general, villages where the level of life is harsher or poorer will tend to have simpler costumes made from rougher materials such as homespun wool or cotton. Those villages where life is economically richer have costumes made from richer, finer materials such as silk or imported fine wools, and their jewelry will often be of gold. 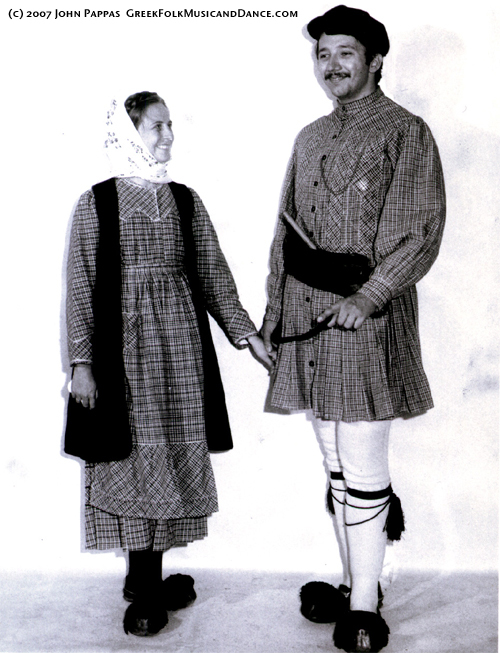 In many of the regions of Greece, we can even tell the age or marital status of a person by his/her costume. 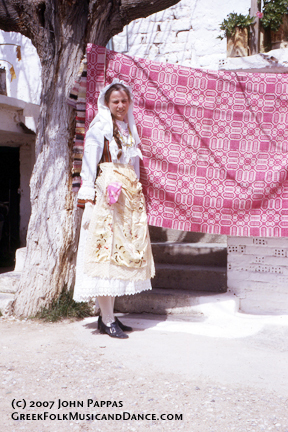 For example, in Kandyla, a village in the Mantineia area of Arkadia in Peloponnisos, a young, unmarried girl wears a white, block printed Mandili for her head covering. A married woman who is a bit older will wear a similar Mandili, but the color is a bright yellow. The older woman will wear a darker, green or brown colored Mandili. Finally, a widow will wear a black Mandili. Just this one, simple part of a woman's costume is a fascinating study in its own right. In Kandyla alone, there are several different ways of wearing or tying the Mandili, depending on the occasion, the temperature, or the activity that the woman is involved in. 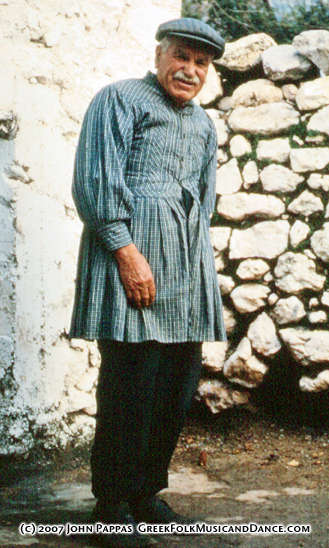 Man's costume from Skyros. The white vest was typically worn by shepherds. 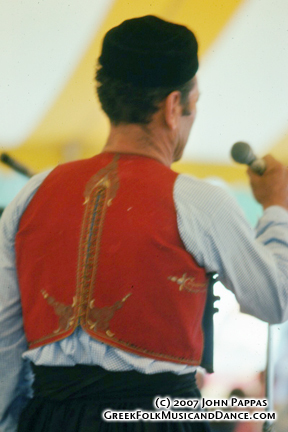 Black vests were typically worn by farmers. Mantzourani, pictured, is weaving a goathair rope. Smithsonian Bicentennial Folklife Festival, 1976. 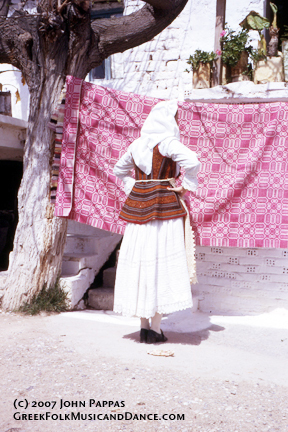 Back of a man's vest from Skyros. This is one of the "black" vests worn by farmers. Smithsonian Bicentennial Folklife Festival, 1976. 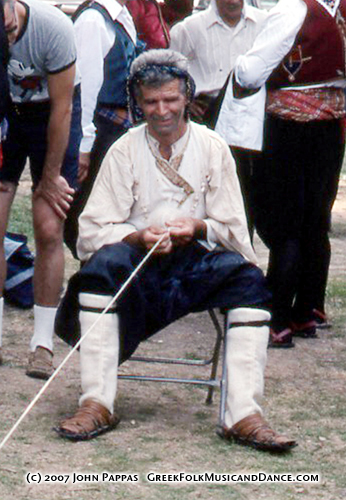 Man's costume from Skyros - legwear and shoes (handmade leather "Trohadia"). Smithsonian Bicentennial Folklife Festival, 1976. Men, women, and children in Skyrian dress. Smithsonian Bicentennial Folklife Festival, 1976. 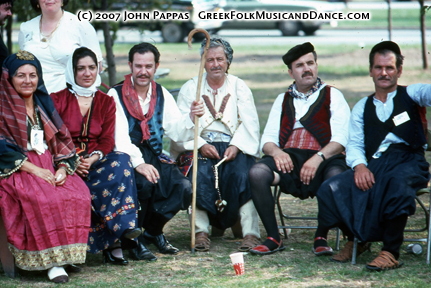 Island costumes: Skyros lady, lady and man from Amourgos, Skyros man (shepherd vest), Kythnos man, Skyros man (farmer vest). Smithsonian Bicentennial Folklife Festival, 1976. 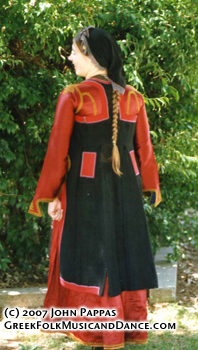 Back of the Skyros woman's ensemble. Smithsonian Bicentennial Folklife Festival, 1976. John in foustanella from Tripolis, Arkadia. Paula in Sarakatsana. 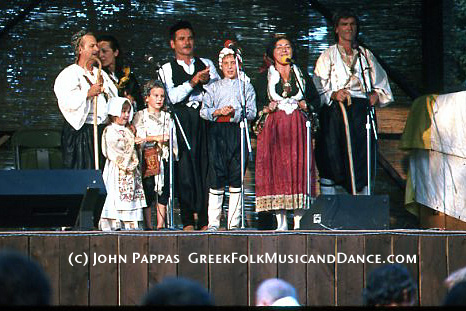 Sarakatsani foustanella and Sarakatsana ladies ensemble, Thrace. Epiros: Ladies dress ensemble and man's foustanella from Metsovon. Paula in Florina, from Macedonia. John in Foustanella. Paula and John in Kandylan dress. The cotton homespun fabric in "plaid" patterns is called "alatzia." 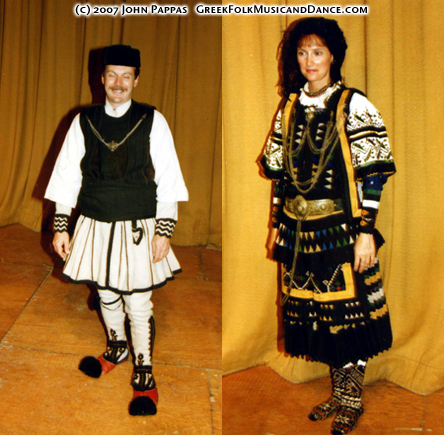 It is obvious that the subject of Greek Costumes is very rich and complex. This is only a very simple collection of comments. This page was last updated on 10/7/2007.